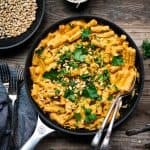 This creamy vegan roasted red pepper pasta is everything! So simple, but packed with flavor – the perfect easy crowd-pleasing weeknight dinner. 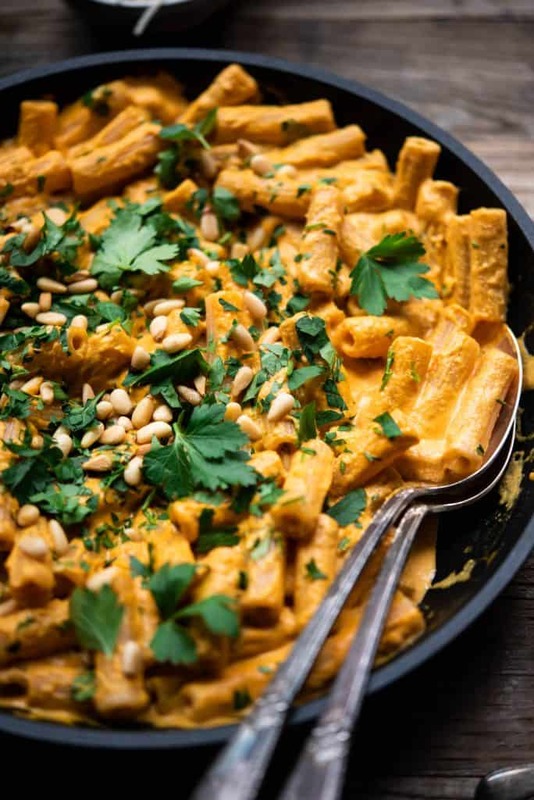 Our roasted red pepper cream sauce is made with a cashew cream base. 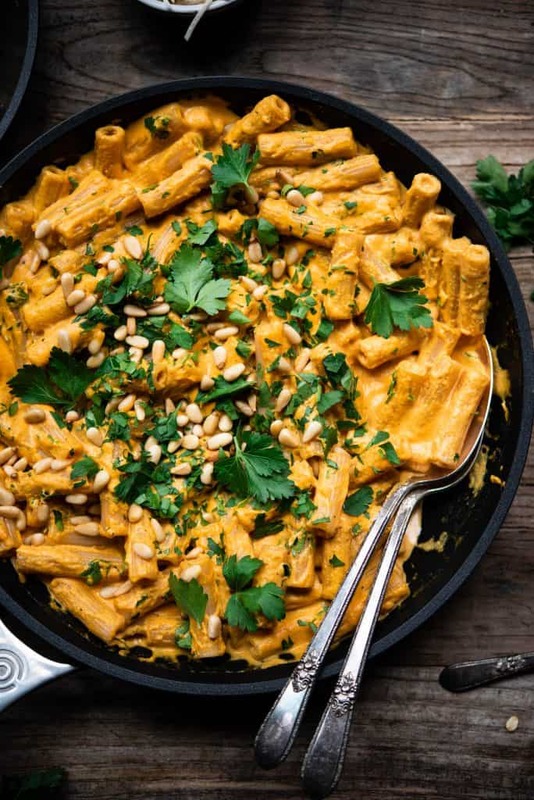 Soaked cashews blend up into a beautifully smooth, silky sauce that perfectly coats pasta! We used gluten free rigatoni, but it’s also great with spaghetti pasta. Topping are simple but complementary – lots of fresh parsley for some brightness, and perfectly toasted pine nuts for depth of flavor and a bit of crunch. Oh, and some vegan parmesan (because duh!). If you forget to soak the cashews for the roasted red pepper sauce, or don’t have time, you can soak them in hot water for 15-20 minutes. The sauce may not be quite as creamy, though, and you may have to blend for a bit longer. Taste-wise, it will be the same. If you’re reading this between 2/6 and 2/11, head on over to our Instagram. 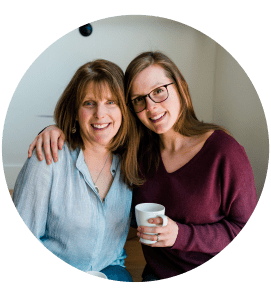 We’re running a giveaway with Le Creuset and Feedfeed under this photo! We used two of their nonstick pans (which are fantastic!) 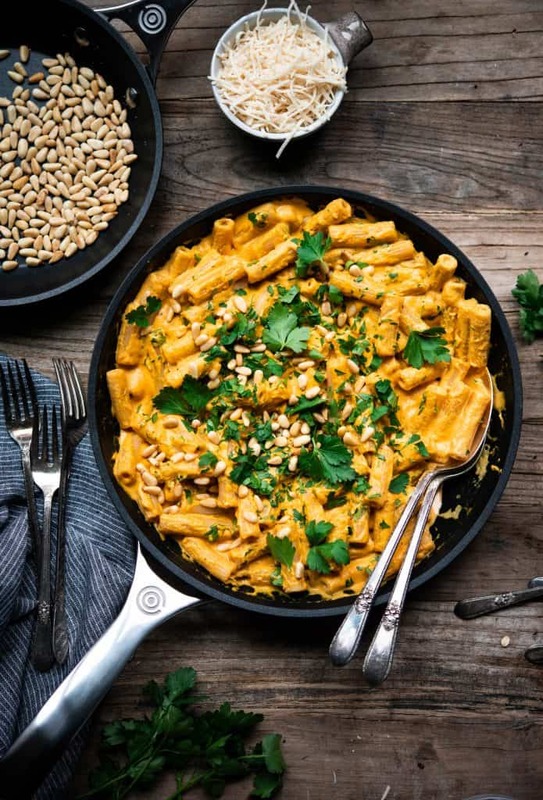 to bring this vegan roasted red pepper pasta together. There’s nothing better than a great nonstick pan. Clean up was SO easy, and there was certainly no sticking of anything. We’re giving away 2 nonstick pans to one lucky winner, so if you’re in need of some new cookware, head on over! It only takes a few minutes to blend up this creamy vegan roasted red pepper sauce – you can even make it ahead of time for a super quick weeknight dinner! Cook pasta in salted water according to package directions. Reserve water – we’ll be using a bit in the sauce! De-seed peppers, quarter and place on sheet pan with a bit of olive oil with diced carrots. Roast 15-20 minutes, then remove from oven and place in bowl covered with aluminum foil. After about 10 minutes, remove skins from pepper (they should come off pretty easily) and discard skin. Meanwhile, in a small pan over medium-low add 1 1/2 tbsp olive oil, shallots and 1/2 tsp salt. Sauté 3-5 minutes, until slightly softened. Add garlic and continue to cook 3-5 minutes. Stir frequently. Add cooked shallot/garlic mixture, roasted peppers + carrots, cashews, remaining salt, nutritional yeast, lemon juice, pasta water, turmeric, paprika and pepper to a high speed blender and blend until it forms a paste. Add olive oil and continue blending until smooth and creamy. Pour over cooked pasta and toss well to coat. Add more reserved pasta water if needed to thin out. Top with toasted pine nuts, fresh parsley and vegan parmesan. Enjoy! To make this a bit quicker, sub homemade roasted red peppers with a store-bought version.